We have several fruit trees in our backyard and an Asian Pear is one of them. This year the branches were so laden with fruit that one of the branches actually broke forcing me to bring in the pears and use them. Some of them were rather small as this was early in the season. But since Asian Pears are usually pretty firm and even crunchy when ripe, I was able to use them. I actually let them sit in the house for about a week to ripen sufficiently. Fortunately, there are still many more pears on the tree that are reaching their potential in size and ripeness. With this first batch I decided to make a Pear Tart. 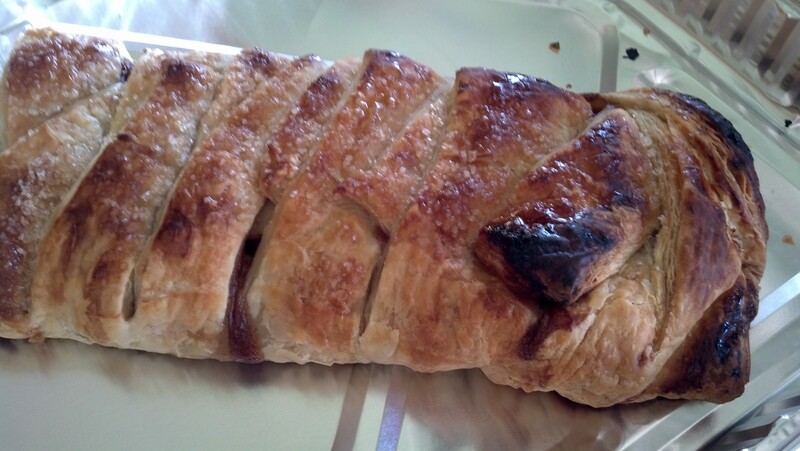 I love Pears and I love Pastry, especially that made with Puff Pastry. 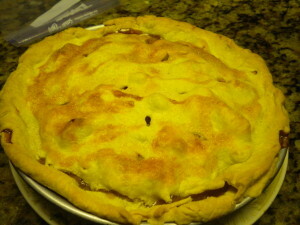 The Tart that I made is really fun to do in that when you place the fruit and filling on the pastry, it is flat. 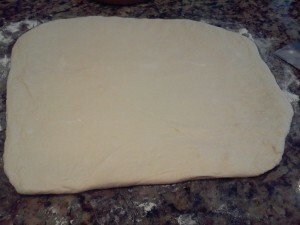 You place the filling on the dough and leave almost an inch of dough all the way around. 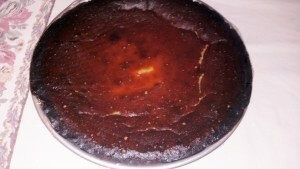 When it bakes, the sides raise up to form a rim around the tart. The instructions and photos will be give below. Please be sure and try it yourself and see how good it can be. 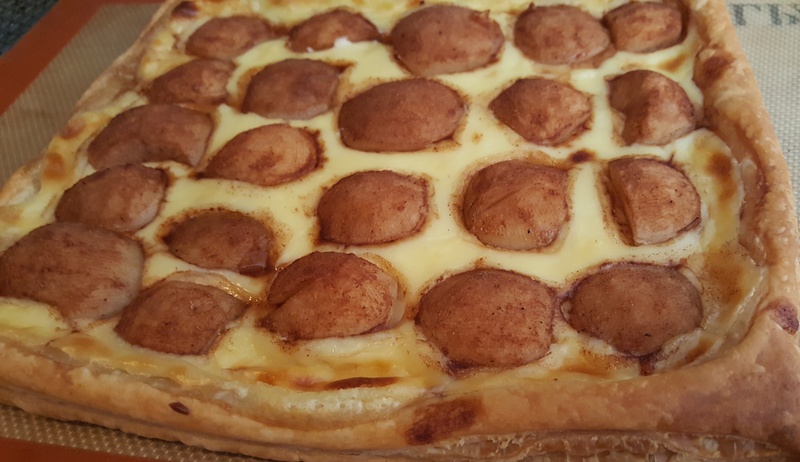 The ingredients you will need for the Pear Tart is a sheet of Puff Pastry (or you can make your own pastry dough and fit it into a tart pan. The only kind of pastry dough that will raise up around the filling is the puff pastry. So Ingredients listed below. 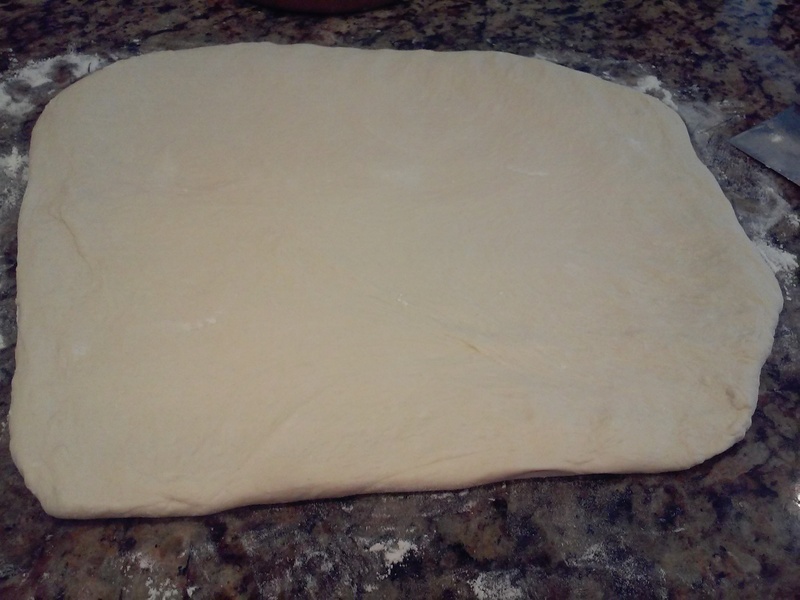 Puff Pastry (This dough takes a long time to make but it can be purchased in large sheets at a restaurant supply such as Smart and Final. Make your Custard and set aside. Place in a colander; rinse and dry thoroughly. 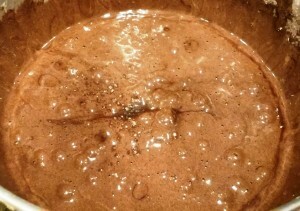 Then place in a medium size mixing bowl. Combine 2 Tbsp. of Tapioca (can be purchased in an Asian Market or Restaurant Supply House) or Corn Starch, 1- 2 Tbsp. Cinnamon (depending on your taste), 1/4 cup Brown or Granulated Sugar. 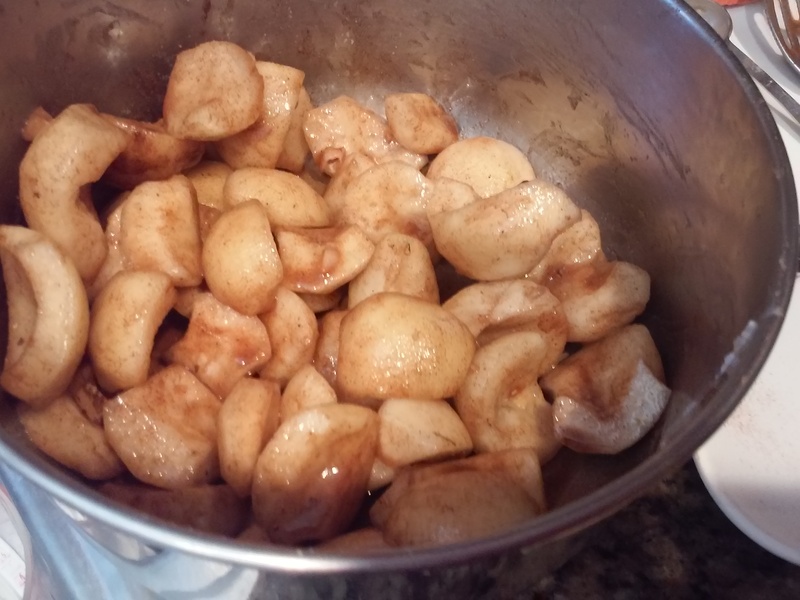 Toss the quartered Pears with the Starch/Cinnamon Mixture and set aside. Use a dull knife (such as a butter knife or pie trimmer) to mark off the edges – 1/2 to 3/4 inch. Use your Docker or Fork to poke holes in the dough – all over!. 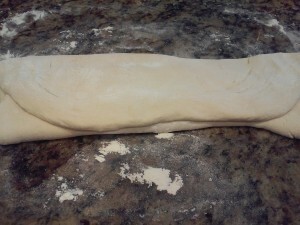 (This will prevent the pastry from raising up.) In the photo below are the Docker, a Pizza Cutter and an old-fashioned Pastry Trimmer. Preheat your oven to 400 degrees and make sure the baking rack is at the middle position. 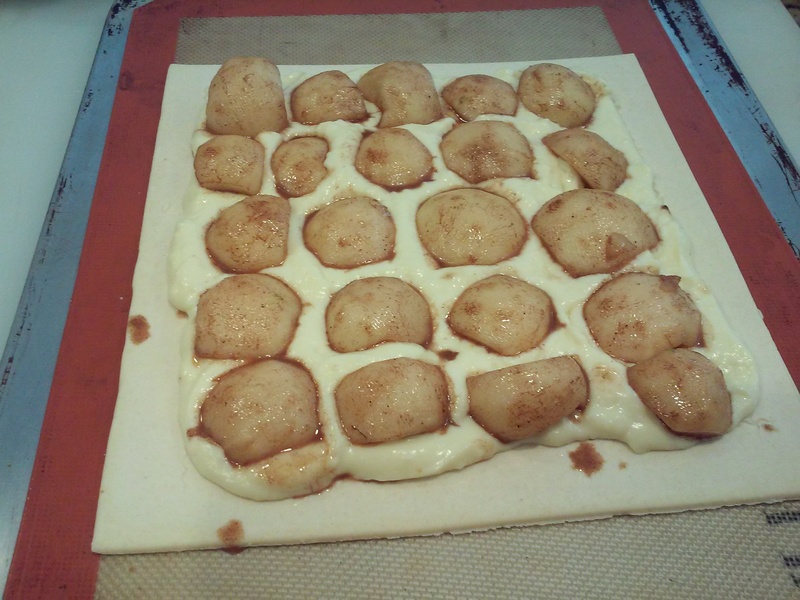 Evenly spread the Custard on the Dough within the lines that you marked. 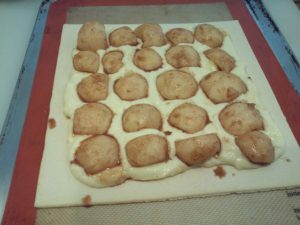 Arrange the Coated Pears evenly over the Dough. 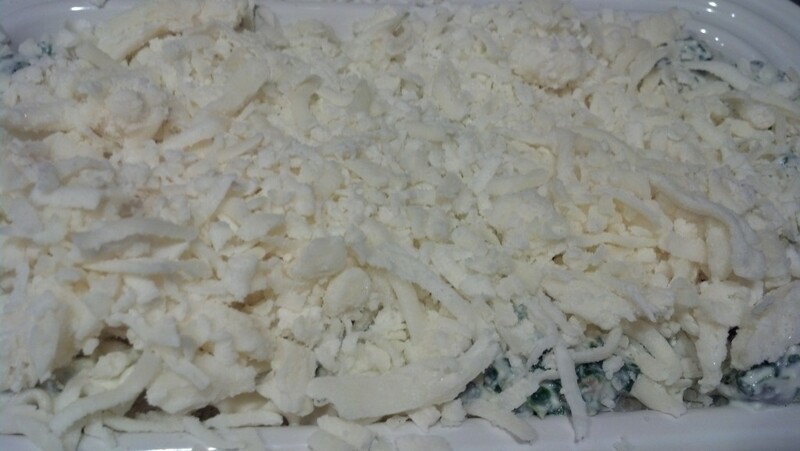 Place in the preheated oven and bake for 20-25 minutes. 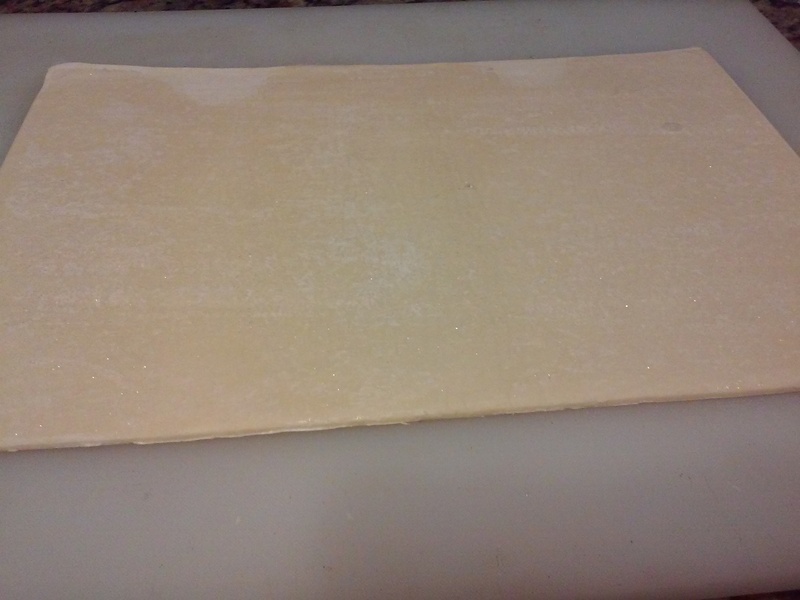 The Pastry edges that raised up should be a dark golden color when finished. You want to be sure that the pastry is well baked before removing form the oven. Allow to cool slightly before serving. Cut into squares and serve as is or with Whipped Cream. 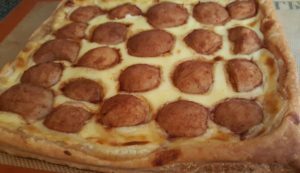 This Tart make a delicious dessert or can also be eaten for breakfast! Ev requested a Black Forest Cake for his Birthday this year. I made for past Birthdays and he loved it so much he wanted another one. So now I have decided to document the preparation of this utterly delicious, decadent cake. 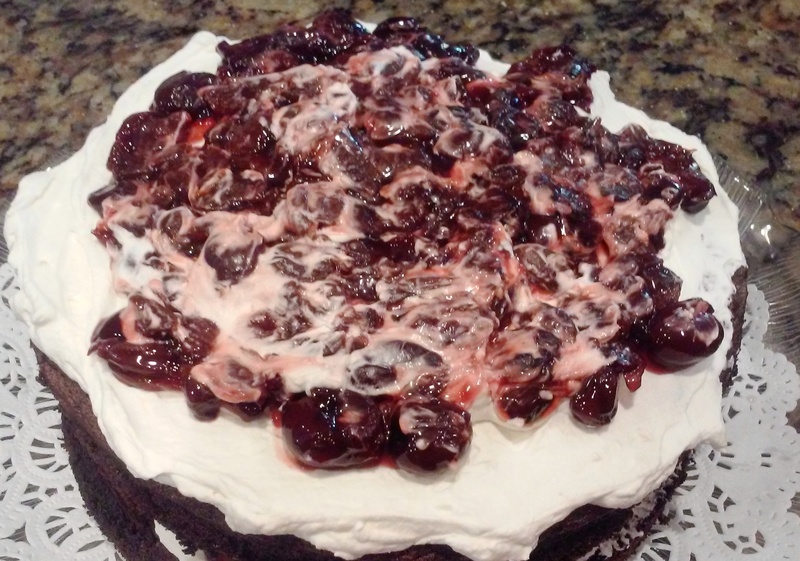 If you can, make it when fresh Cherries are available but if not, then frozen or canned Cherries will work. This year I used dried Cherries which I reconstituted in Cherry Liqueur along with frozen Cherries. 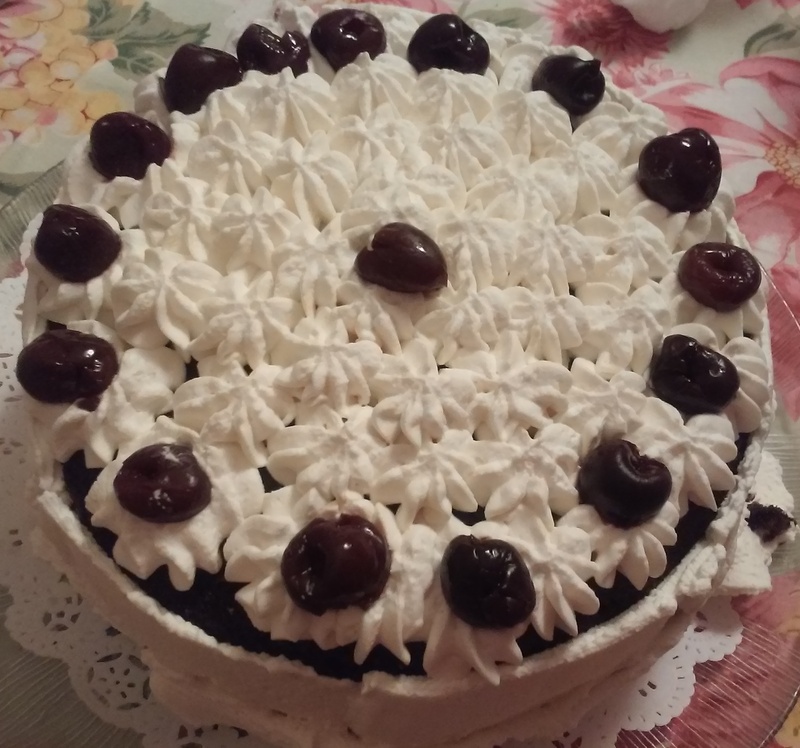 There was an excess of frozen Cherries, so I put the leftovers on top of the cake as decoration. First of all, gather and measure all of your ingredients. Separate the Whites from the Yolks and allow them to come to room temperature. Prepare three 9″layer pans by spraying with a Vegetable Spray and then fitting with Parchment or Waxed Paper. Sift together the Flour, Cocoa Powders and 1/4 cup of the Sugar. Beat the Egg Yolks and 1/4 cup of Water with an Electric Mixer until they are thick and light colored. 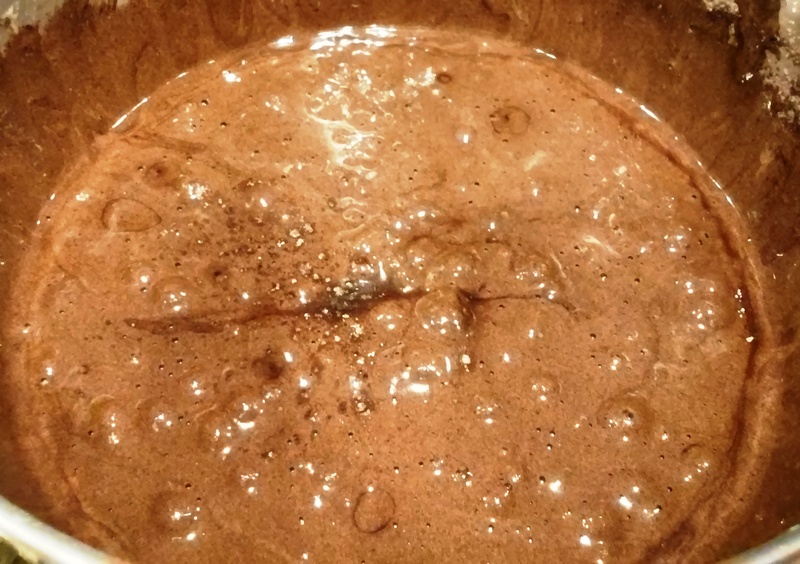 Gradually add the Sugar while still beating; once all the Sugar has been beaten in add the Flavorings. Exchange the Wire Beater for the Paddle Beater. 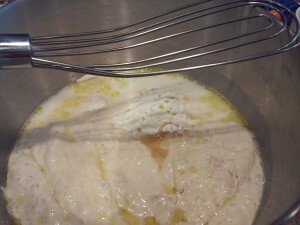 Sift the Flour Mixture over the Beaten Egg Yolks and slowly beat it in with the Paddle Beater. 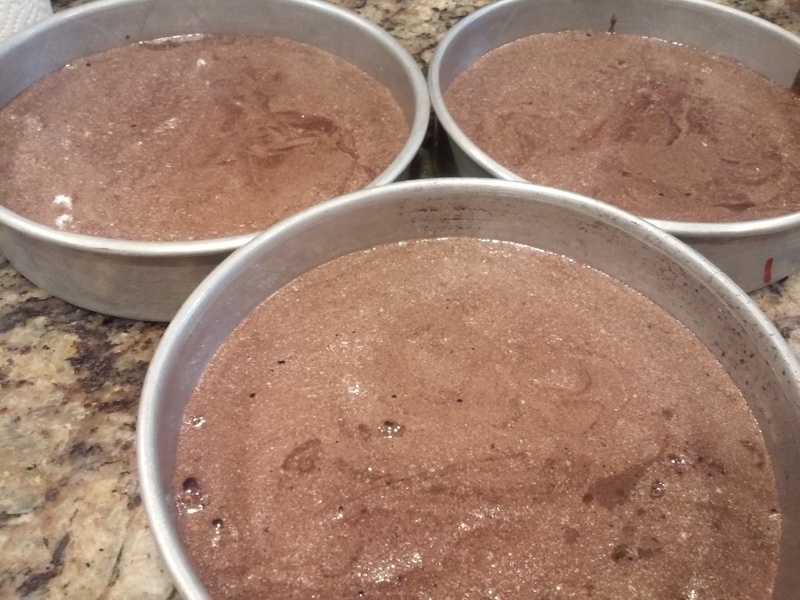 Once all the Egg Whites have been well-blended into the Chocolate Batter, pour into the prepared pans and bake in the preheated oven for 20 minutes or until a toothpick inserted in the middle of each layer comes out clean. Set the pans to cool on a wire rack; once the layers are cool to the touch (about 15-20 minutes) invert onto the rack by placing the rack over the pan and turning over. Cool the layers completely before assembling. While the layers are cooling, prepare the syrup, the filling and the Chantilly Creme. (This may also be done while the cakes are baking) See the link above for the recipes and directions. Brush the cake layers with the Syrup. Place the first layer, top side up on a serving plate and spread with the Chantilly Creme. Add half the Cherry Filling and the second layer of cake. 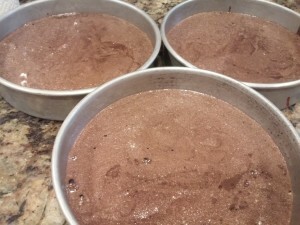 Repeat the process with the second layer and then add the third layer. Use a pastry bag filled with the Chantilly Creme and drop Rosettes on the top of the Cake. If there is Creme left over, spread it on the sides of the cake. 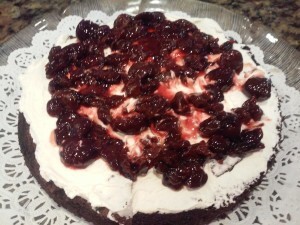 Top each Rosette with a Cherry (if any leftover or use Maraschino Cherries or none at all, if preferred. Refrigerate at least one hour before serving. 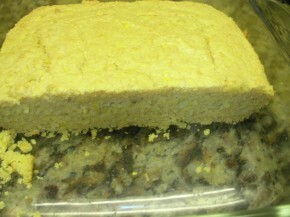 When serving cut with a serrated knife and cut small to moderate pieces as this is a rich cake. Delicious, but rich! Here we go again! Remember the Gingerbread Waffles made from the leftover pieces of Gingerbread Houses? Well, with only a 2 person Household, you can only eat Gingerbread Waffles so many days in a row and since I hate to throw good food away, I did it again! 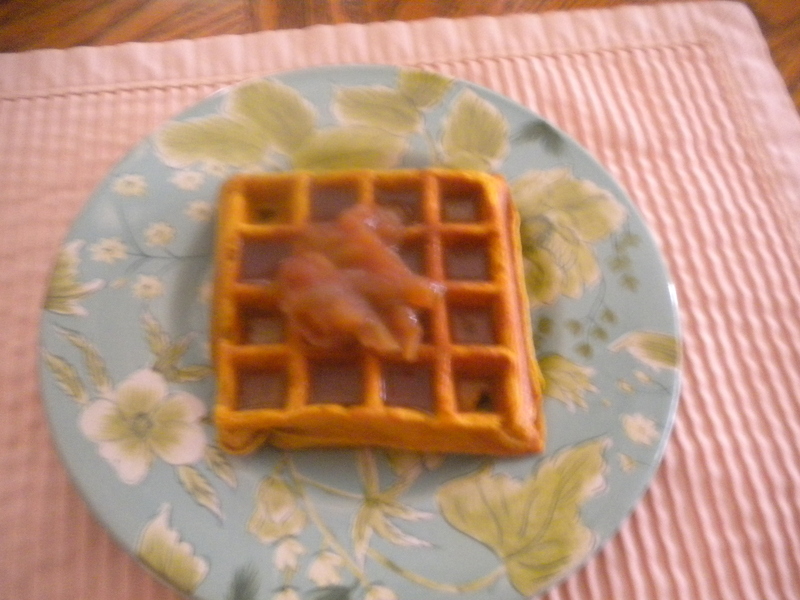 I decided to make cookies with the Waffle Batter and wouldn’t you know, I did not think about putting extra sugar into it – Waffles don’t need a lot of sugar since you usually pour syrup on them or top with sweetened fruit and when we tasted the cookies – uh oh! They tasted like Gingerbread Biscuits – not very palatable – so instead of throwing the cookies away, I just dried them out and pulverized them again just like I did with the leftover House pieces. 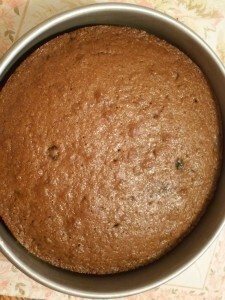 I then used my Zucchini Bread Recipe as a guide and made a delicious moist Gingerbread Applesauce Cake with Raisins. This was a delicious and satisfying Breakfast Delight! So here is how I made the Gingerbread/Applesauce Cake. 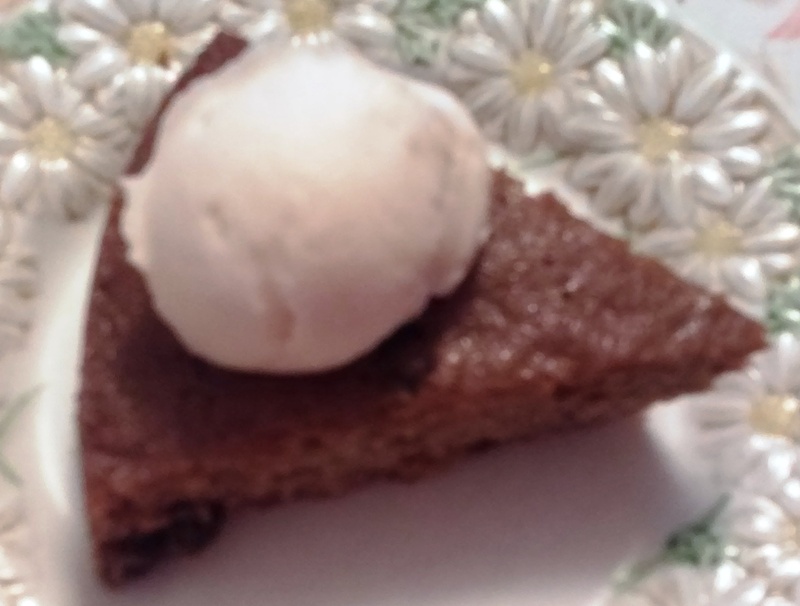 The recipe can be adapted for use without the leftover Gingerbread pieces. Just let me know and I will change it for whoever would like it. 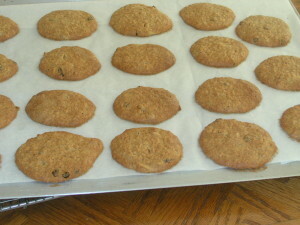 Pictured below are the cookies – i left them uncovered for a couple of hours to dry them out – they were a moist cookies and would have been really good with some sugar and maybe some raisins added to them. Place the cookies in your Food Processor and chop them up, using the PULSE BUTTON at first; once they are broken up, then turn it on and run just until they are a fine crumb – not more than a couple of seconds at a time. 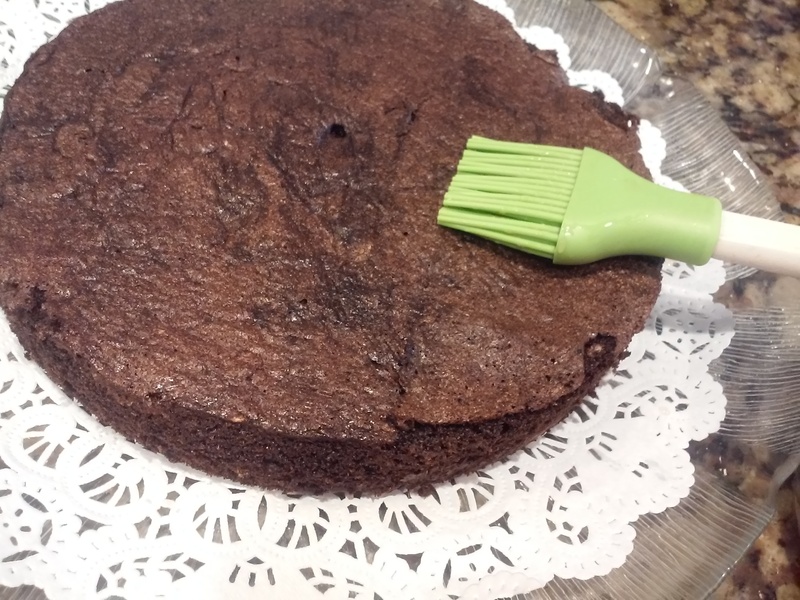 This cake was all made in the Food Processor, but if you don’t have one or prefer not use it, you can do this with a Portable Mixer, Standing Mixer, or even with hand implements. Once you have your crumbs, Applesauce and Rasins prepared and measured, begin making your cake. Adjust the oven rack to the middle position and heat to 350 degrees. Butter, or spray an 8 or 9″ round or square pan and set aside. 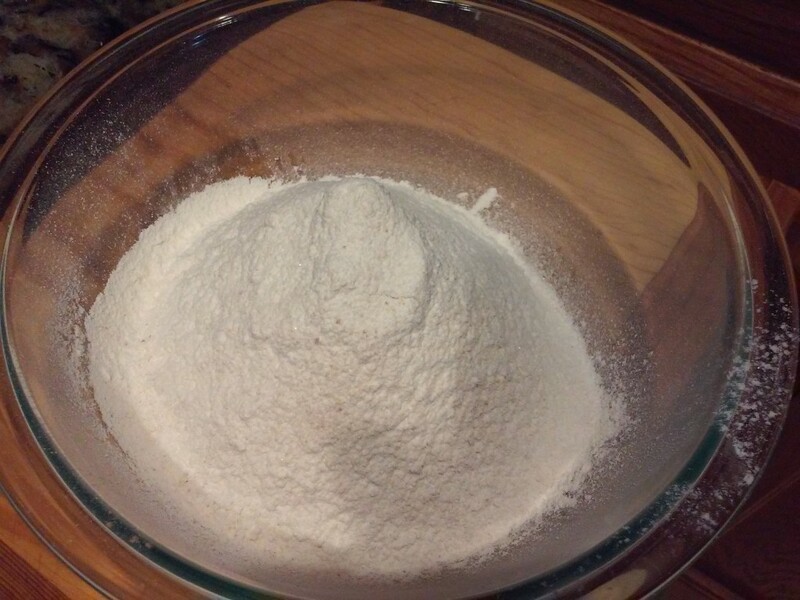 Combine the Flour, Salt, Baking Soda and Spices in a medium size bowl. Place the Eggs in the Food Processor and run until they are well mixed. Add the Brown Sugar, Butter and Vanilla and mix again. Add the Applesauce and Pulse until it is well distributed. 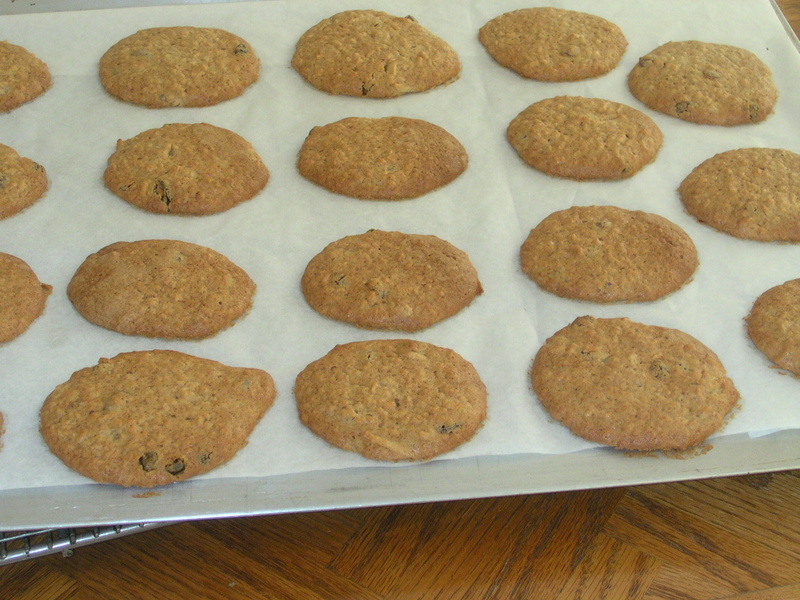 Add the Raisins and pulse, just until they are distributed throughout the batter. 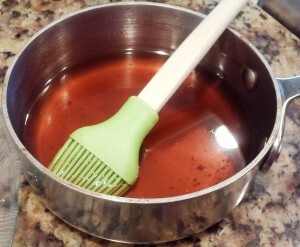 Pour the mixture into the prepared pan; tap lightly to level and then bake for 45 minutes or until a pick inserted in the middle comes out clean. Allow the cake to cool on a wire rack before inverting onto a serving platter. Serve warm or at room temperature with Vanilla Ice Cream or top with a Cream Cheese Frosting. Baking is one of my favorite things to do and during the Winter Holidays I make Gingerbread Houses and I teach other people how to make Gingerbread. This past December, in addition to my classes I baked and built four different houses. One for the Cancer Support Community’s Holiday Boutique, one for a sample for my class, one for home and one as a gift. There are two ways to bake the houses – one is to cut out the pieces from the unbaked dough and the other is to bake the dough first before cutting out the pieces. 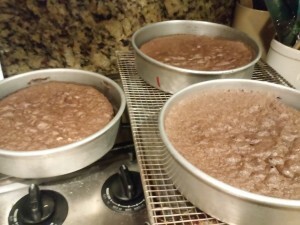 The advantage of the second method is that the pieces will all fit together without additional trimming after the baking process. The disadvantage is that there are going to be a lot of sections of cookie that will not be big enough for any house, except for the chimney and how many of those do you need? Now we do love to eat the leftovers but when there are a lot of leftovers, you can only so much. 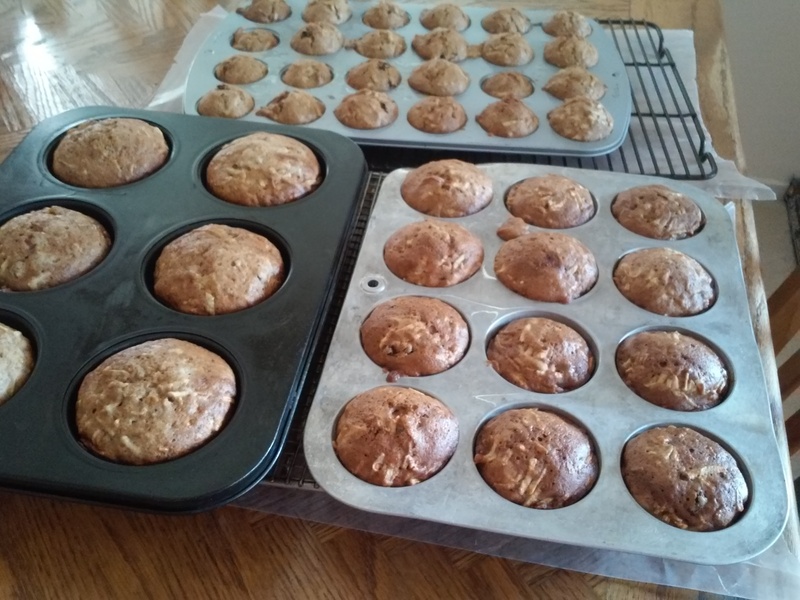 As I said, Baking is one of my favorite things to do, but another one of my favorite culinary activities is to turn leftovers into new products and that is what I did with the leftover Gingerbread pieces. 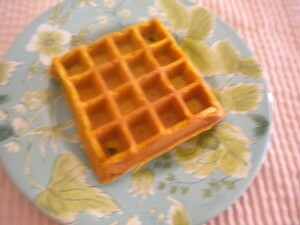 I pulverized them to a fine crumb in my Food Processor and turned them into a Waffle Batter. 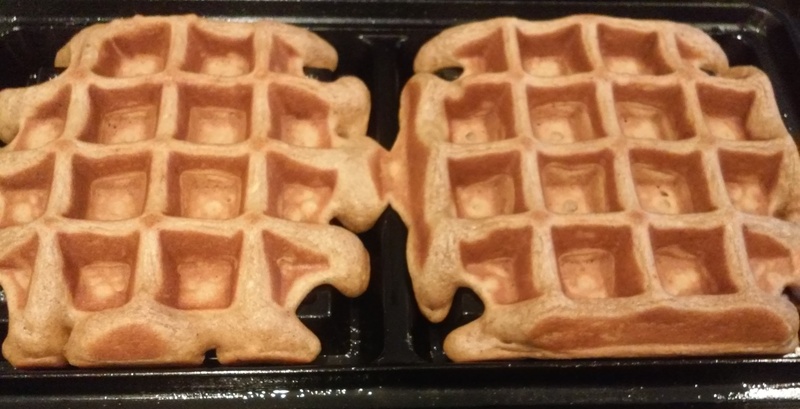 If you like Gingerbread, then you certainly will like Gingerbread Waffles. Here is how I did it. Break up the leftover Gingerbread pieces into sections that will fit in your Food Processor that has been fitted with the Chopping Blade. Use the Pulse Button to break up the pieces into small pieces and then turn it on to finely chop the Gingerbread pieces. You should end up with a medium to fine crumb. Measure the Crumbs – 2 cups of Gingerbread Crumbs will make enough waffles for 3-4 people. Use your Food Processor (do not wash out the bowl) or a large mixing bowl. Beat 3 Eggs until well mixed and then add 1 1/2 cups Buttermilk and blend together. Combine the Gingerbread Crumbs with 1 1/2 cups of All-Purpose Flour, 1 tsp. Cinnamon, 1/2 tsp. Ground Ginger and 1/2 tsp. Baking Soda. Add to the Buttermilk/Egg mixture and Pulse, just until mixed. 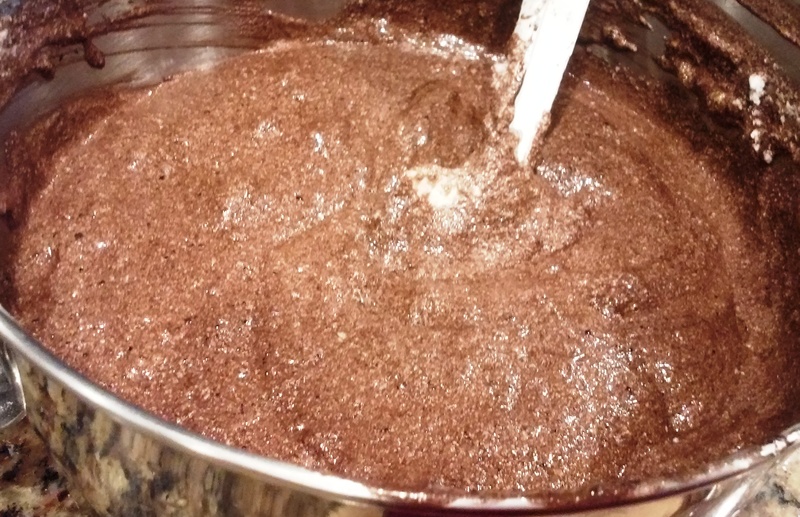 If doing in a bowl, with a whisk, just mix until the Ingredients are blended – DO NOT OVER-MIX! 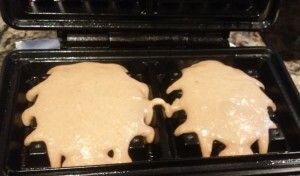 (Over-mixing Waffle, Pancake or Muffin Batter will make the product tough. Stir in 1/4 cup Melted Butter. Heat your Waffle Iron until the indicator light tells you the Iron is hot. If necessary, lightly oil or spray the surface of the Iron. Close and Bake until the steaming stops. 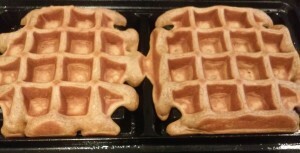 Keep the baked Waffles warm in a low oven until you are ready to serve them. 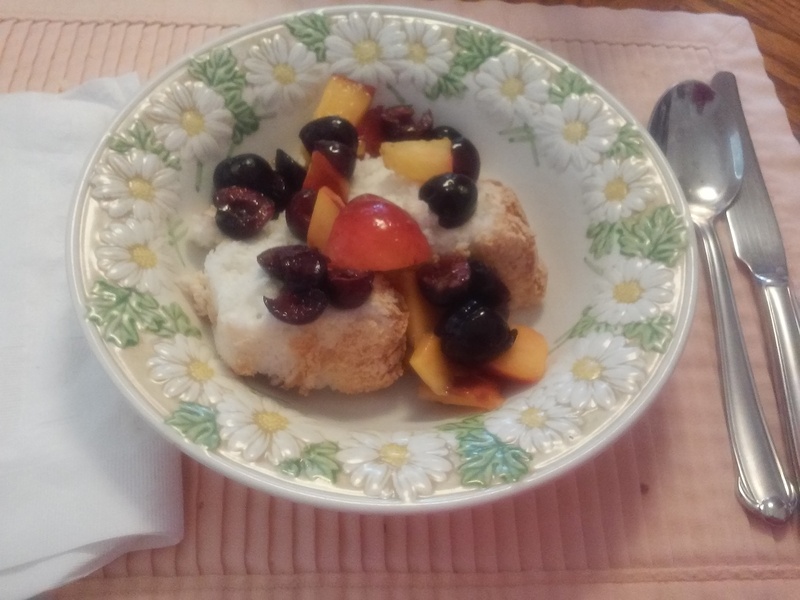 Serve with Fruit Compote and or Maple Syrup and melted Butter. The Waffles in the Feature Photo are served with crisply cooked bacon. 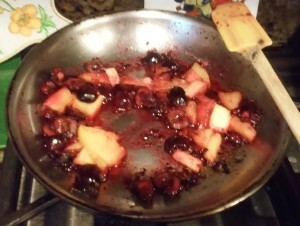 For the Fruit Compote,I melted about 2 Tbsps. 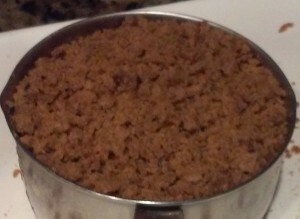 of Butter along with Brown Sugar (2-4 Tbsps.). I then added pitted and halved Cherries, Blackberries and fresh Pineapple pieces. This will work with just about any fruit – Apples are great with Gingerbread as well as Bananas, Mango or Papaya. And this is how you use leftover Gingerbread to make Waffles! As a convenience, I have also listed the ingredients below. Baking is one of my favorite Kitchen Activities and I especially love making bread and the Winter Months are the ideal time to do it. Not only will the result be a delicious product but your kitchen and your home will be warm with the fresh fragrance of baking bread and the communal warmth your family will feel when sitting down to the table and enjoying freshly buttered bread with their meals. I love to watch the dough raise up and the smell of freshly baking bread is indeed heavenly. When a fresh loaf comes out of the oven your taste buds perk up and your mouth waters for a slice of that hot, buttered bread! One of my favorite type of breads is Ciabatta. Ciabatta is Italy’s answer to the French Baguette. It was created in 1982 to stop the influx of French Baguettes into Italy. The Bakers there were afraid that the use of the Baguette would hurt there business. Ciabatta is a crusty bread with a chewy inside texture. 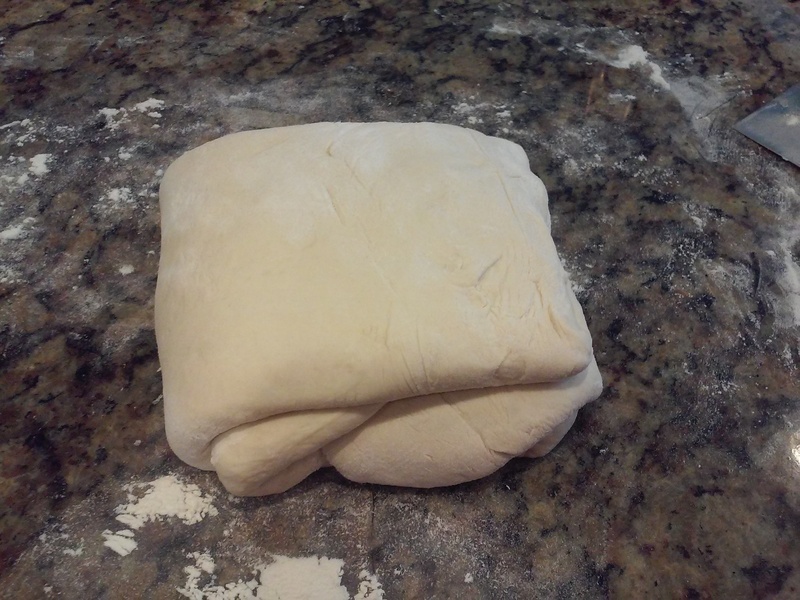 It is fairly simple to make, although it does take a little bit of time but if you do spend the time, the dough is so nice and easy to work with it is actually fun, not work to make this bread. And when you eat it with melting butter it is so good you can practically swoon over it. You have to make a starter that is called a Poolish. The best time to do this is the night before you plan to make the bread as it has to proof for at least 10 hours. Once the Poolish is proofed, add the Olive Oil and mix it in with a Dough Spatula, if you have one; if not, then use the next best tool that you have – perhaps a Wooden Spoon. 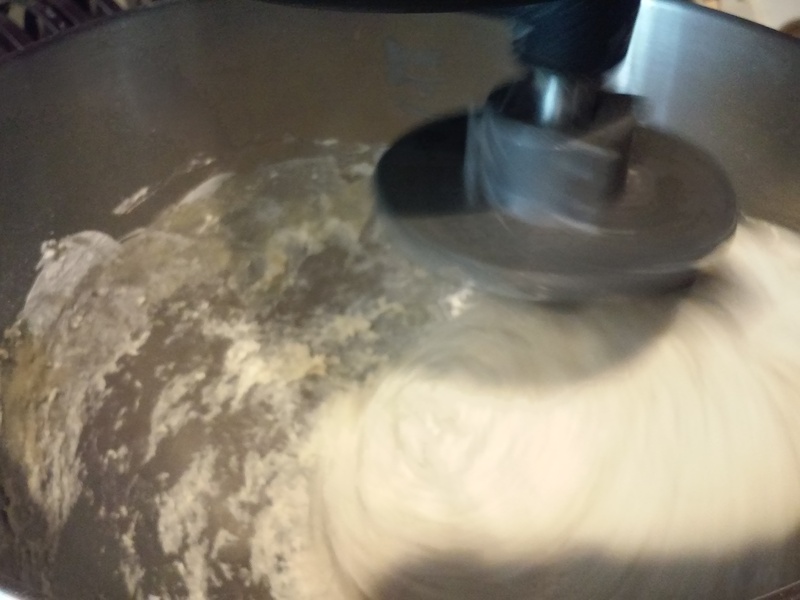 Then you add the remaining ingredients and knead the Dough; a standing Electric Mixer fitted with the Dough Hook is the best to go but if you do not have one, then just make use of your Elbow Grease and knead the dough by hand. Finish making the Dough and let it rest for at least 20 minutes. 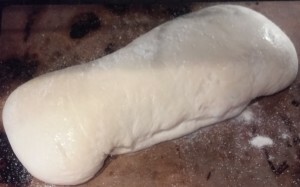 Once the stretching process is finished, then you allow the dough to rest for another 50 minutes before placing it on your baking sheet for baking. 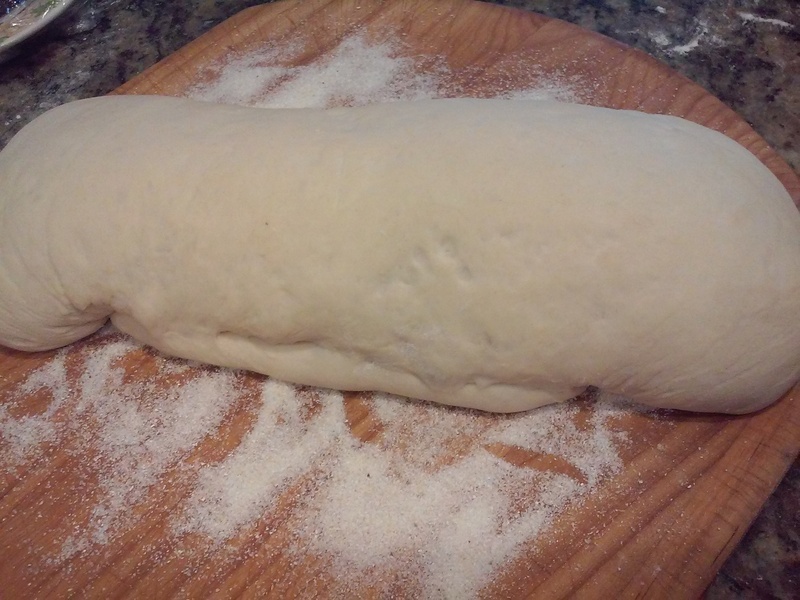 The Dough can be made into a loaf or cut into rolls – whatever you do, unlike most yeast breads, do not flatten the dough – just gently transfer it to your greased and floured (use cornmeal or Semolina on the pans) baking sheets. In the photo below left, the loaf is on a Pizza Paddle and below right, the loaf is on a Baking Stone. The traditional way to bake Ciabatta is to place it on a greased and floured pan and bake it in the middle of the oven with a pan of water on the rack under. 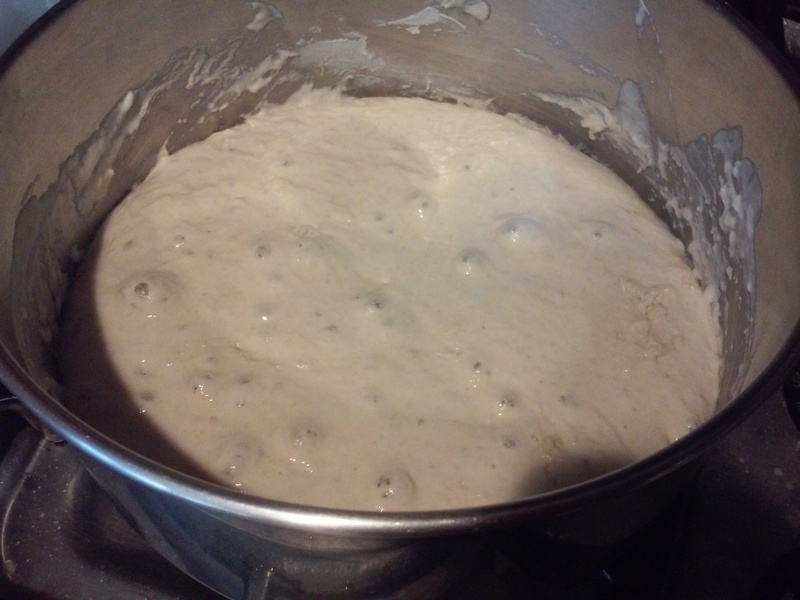 The steaming water helps to give the bread its chewy crust. The Baking Stone is an alternative way to bake the bread. It still comes with a nice crusty exterior. Thanksgiving is right around the corner and while everyone is trying to think of ways to use the turkey leftover from the Holiday Dinner how about different ways in which to use Pumpkin. 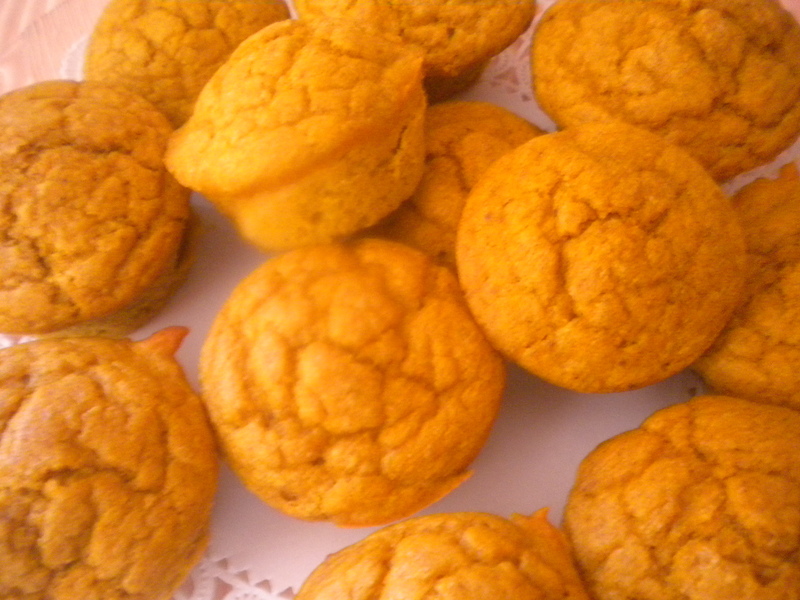 Pumpkin itself, does not taste particularly good but when you add spices and sugar and cream and eggs it turns into something wonderful. Here are a list of recipes featured in this blog that you can try for your own Thanksgiving Dinner or for Breakfast or Dessert on Thanksgiving Weekend. 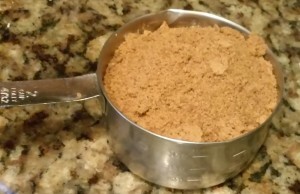 When cooking or baking with Pumpkin be sure to use the Sugar Pie Variety. The larger Pumpkins do not lend themselves to baked or cooked recipes. Easy to do, just add a little more flour. 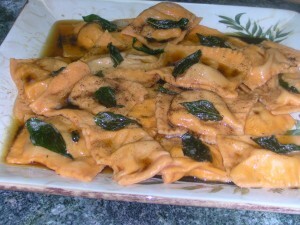 The Ravioli can be made with Pumpkin or Butternut Squash or any Squash of your choice. 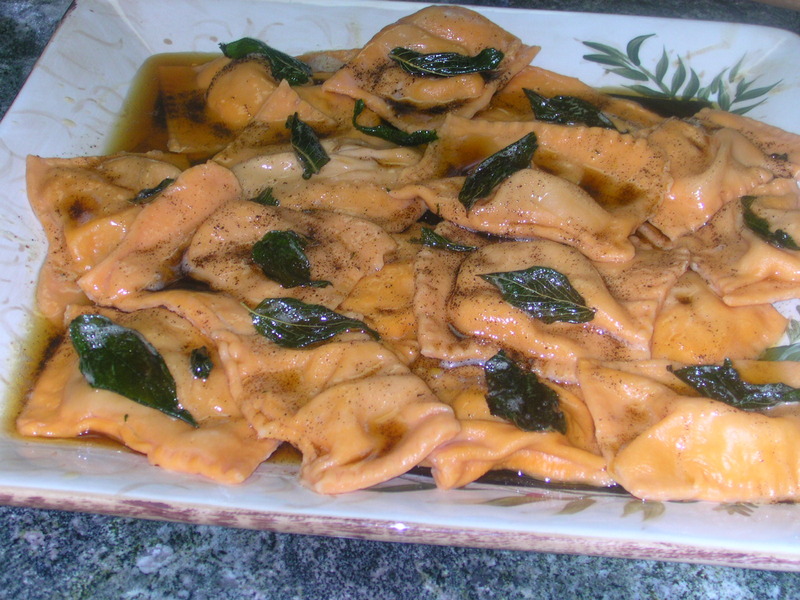 The dark leaves on top of the Ravioli are Sage. 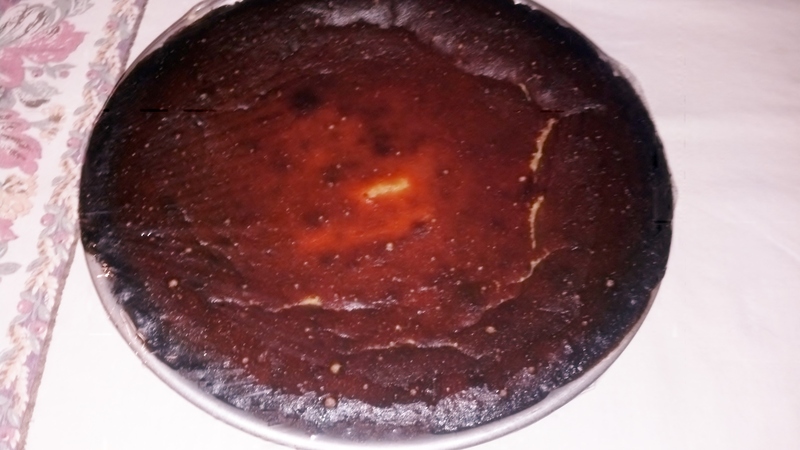 The Pumpkin Pie in Pecan Crust looks dark, but it is actually not burned. 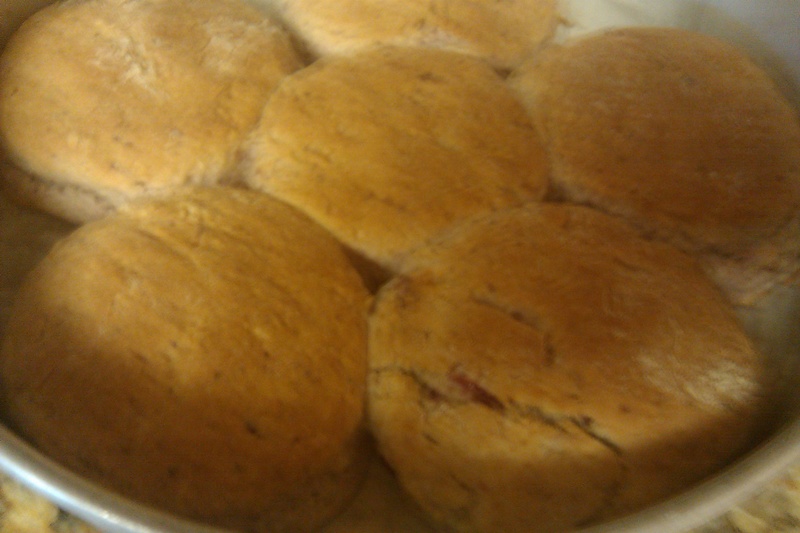 In this case, the oven was too high and it baked at a much faster pace than it should have. Luckily I took it out before it was actually burned. Everyone loved it and it was gone by the end of dessert time. To make the Pumpkin Pie in a Pastry Crust, use the same filling recipe as the Pie in Pecan Crust. Simply substitute a pastry crust of your choosing. Apple Sauce: the Apple Sauce pictured is not a true Apple Sauce. The Apples have been juliened, not pureed. This gives more texture and flavor. This version of Apple Sauce is good as a condiment with Ice Cream, Cereal or on top of cake. 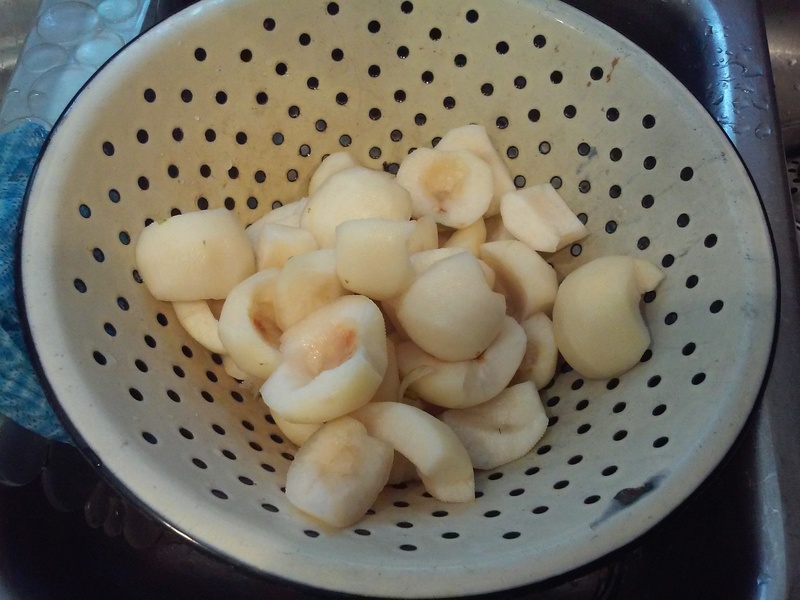 To make the Sauce, peel and seed the Apples and then cut into Juiien strips. If you have a food processor, use the 6 x 6 Julienne Blade to cut them. Place Julienne Apples in a saucepan that is large enough to hold them along with Brown Sugar (minimum amount), some Water or Apple Juice and cook until the Apples give up their moisture and the resulting mixture is of the viscosity that you want. 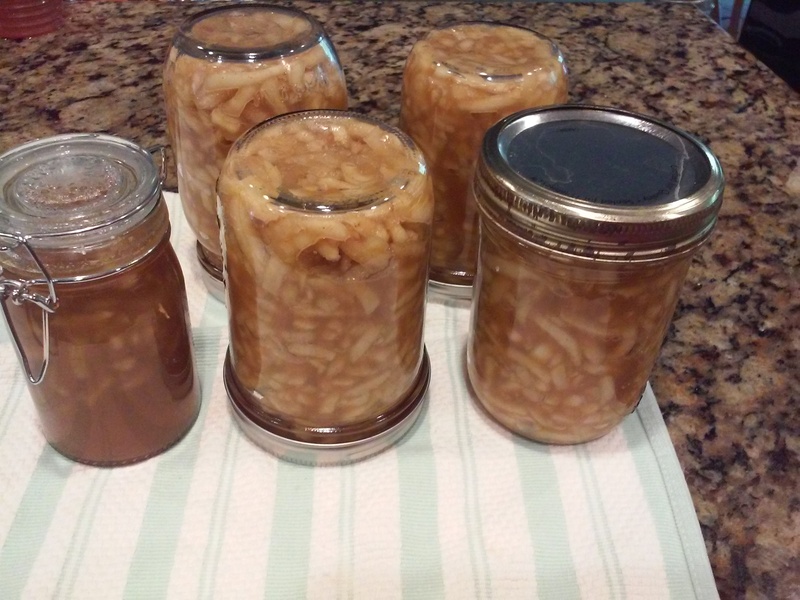 If you do a large quantity pack into sterilized canning jars and seal with caps and rings. Place in a kettle and cover with water to at least 1″ over the tops of the jars and bring to a boil. Boil for 5 minutes. Carefully remove from the pot and turn upside down on a clean dish towel. 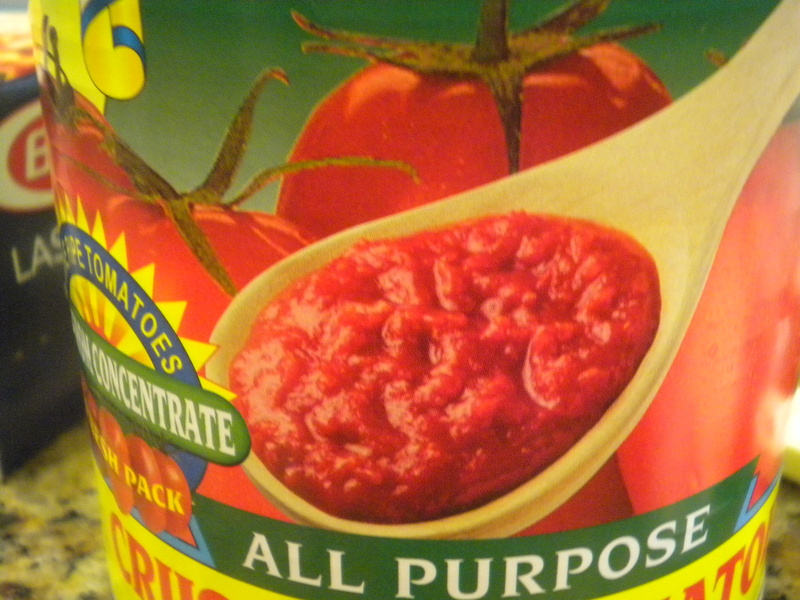 Turning the jars upside down will insure that the lids will seal. 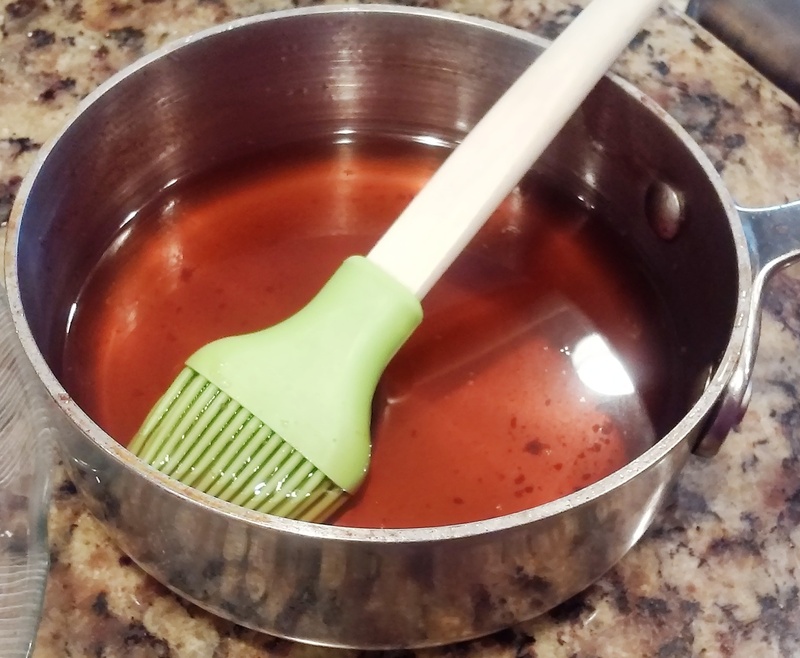 If you use a pot with a rack inside that can be lifted out, this will be the safest way to remove the jars from the hot water. Let stand upside down until cool. Turn right side up and tighten the lids. Store in a cool dry place. Apple Sauce is great with Pork, Poultry and Seafood dishes. 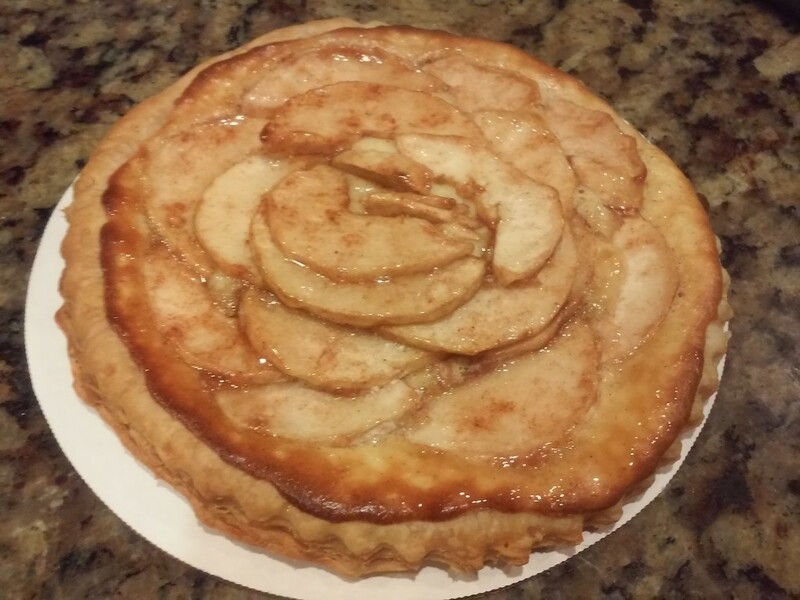 Tarts: An easy way to make delicious, beautiful tarts is to have on hand some Puff Pastry Sheets. Peel and slice your Apples and then place on Puff Pastry that has been cut into a circle or square, whichever you prefer. 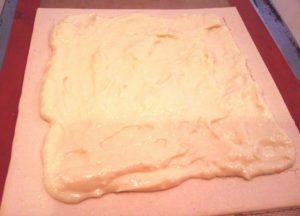 Place the prepared Puff Pastry on a baking sheet – if you have Silpat, use that or just put the pastry on the ungreased baking sheet. 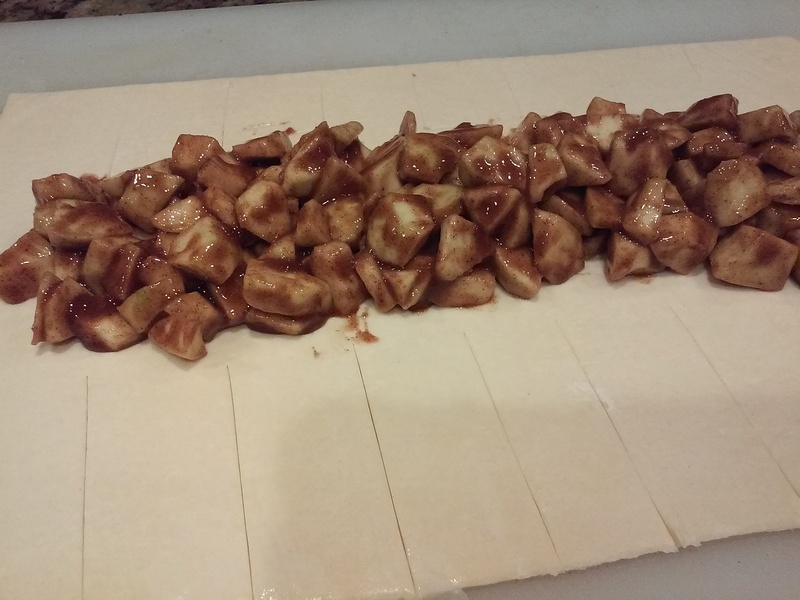 Layer the Apples on the Puff Pastry, being sure to leave about 1″ uncovered all the way around. 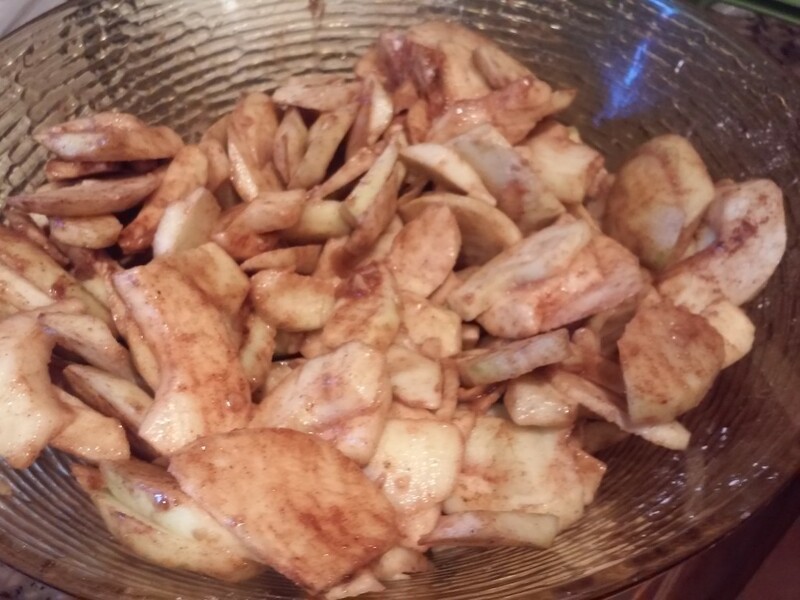 Sprinkle a little Sugar and Cinnamon on top of the Apples. Bake at 400 degrees for 20-25 minutes or until the edges have puffed up to form a rim and are a nice dark golden brown. Remove from the oven and brush the Apples with Jelly that has been heated to melt it down to make it brushable. Once the Jelly has set up, your tarts are ready to serve. Use your Apples for eating, baking or cooking. Have fun and enjoy! Do you have an Apple Tree that is a mass producer? Or do you have friends with Apples that they are trying to get rid of? If the answer to either question is yes, then here is what you can do with them. If the answer is no and you need to purchase apples, you can still use the recipes below. For convenience the recipes are listed in alphabetical order. To make the Apple Braid you will need Puff Pastry Sheets – Sliced Apples as prepared for Apple Turnovers, a Baking Sheet and a knife. 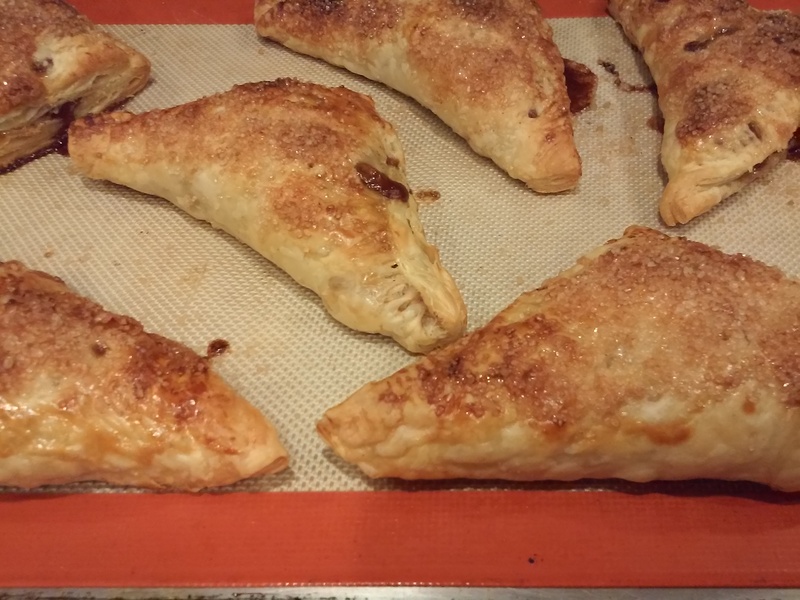 Peel, slice and dress the Apples as for the Turnovers. 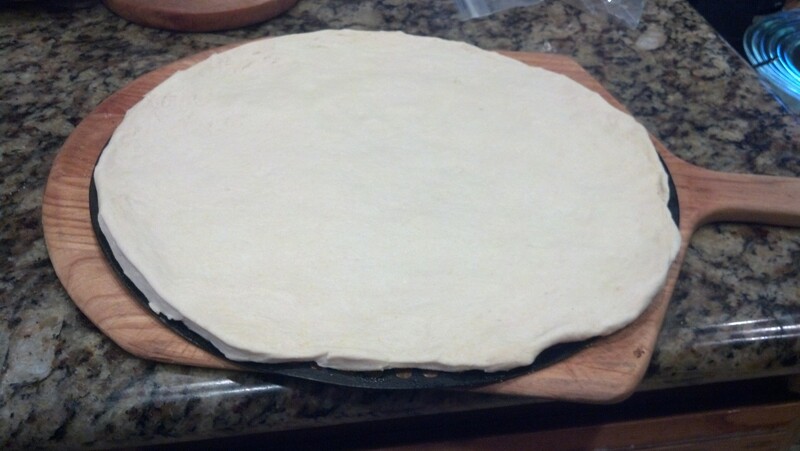 Lay out a large sheet of Puff Pastry (alternatively use Pie Crust) on a pastry board. Arrange the prepared Apples down the middle of the Pastry leaving about 2 inches at either end. 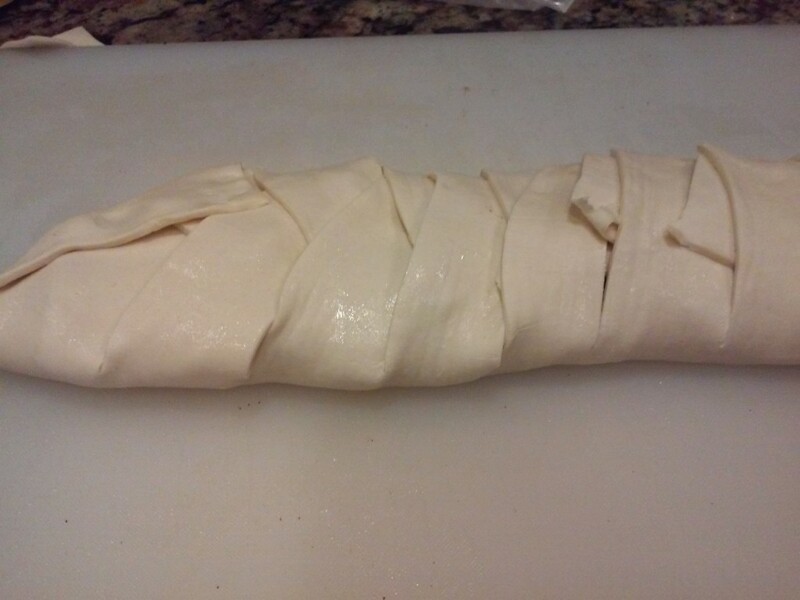 As pictured, cut the exposed pastry into 2″ strips. Lap each piece over the middle, working from side to side. Fold in the ends so that the Apples are completely covered. 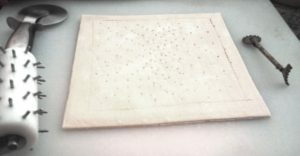 Transfer to a baking pan that has been covered with baking parchment or a silpat sheet. Bake on the lower shelf of the oven for 25 minutes or until the pastry has puffed up and is a dark golden brown. Remove from the oven and allow to cool before transferring to a serving platter or cutting board. To serve, cut into pieces at least 2 inches long. Best when eaten warm and is very good with Vanilla Ice Cream or Whipped Cream. Angel Food Cake is like it’s name implies – ‘light and heavenly’. Angel Food Cake is the perfect summer dessert. 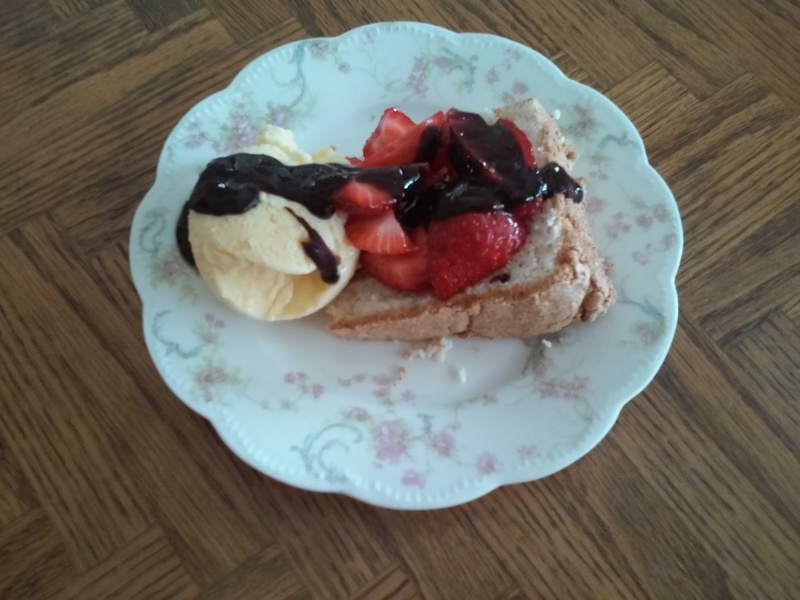 It can be eaten plain (and not make you feel too full or sugared out) or it can be topped with Strawberries and Whipped Cream or filled with Ice Cream and covered with a Baked Meringue for a faux ‘Baked Alaska’. 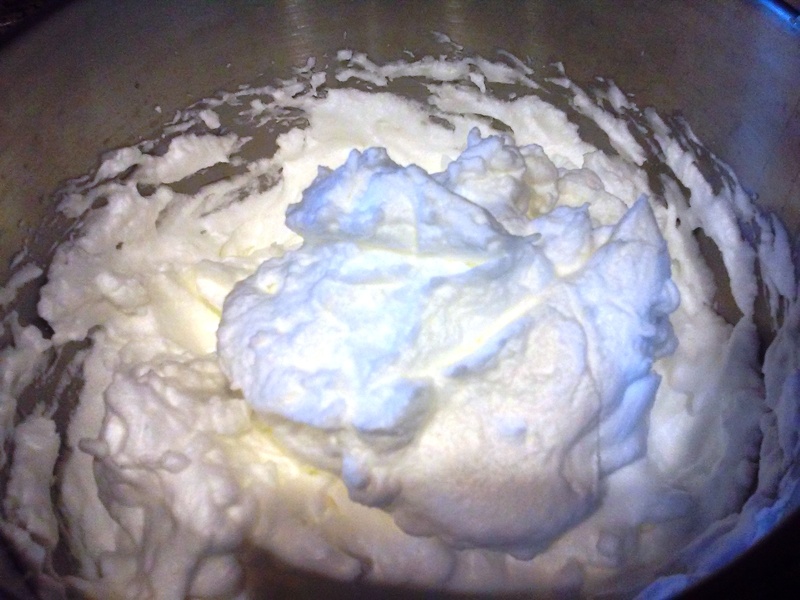 The main structure of an Angel Food is Egg Whites whipped full of air which in turn provides the leavening for your cake. Because it has no fat, an Angel Food Cake has fewer calories than most other shortened cakes. There are three main ingredients in Angel Food Cake – Egg Whites, Sugar & Flour. Add a little salt for balance and Vanilla for flavor and lots of air for your leavening agent. 1. Separate the Egg Whites from the Yolks and make sure that not a speck of Yolk gets into the White portion. Egg Whites are mainly Protein and Egg Yolks contain a good portion of Fat. The Whites will not beat up like they should if you get even a tiny bit of yolk into them. So, when you separate your Whites from the Yolks, follow a few simple rules. Separate the Eggs when they are still cold from the refrigerator. There is less chance of getting the yolk into the white this way. Have a clean bowl for the Whites and another bowl for the Yolks. Have a second smaller bowl to separate the White into before adding to your larger bowl. This way, if some yolk gets into the white by mistake, it is only one white that you cannot use, instead of a whole bowl full of them. If you do get some yolk into the white this way, just combine the White and the Yolk and set aside for another use, such as scrambled eggs or cookies that require a whole egg. If you are not going to use the yolks right away, cover with a thin layer of water and then plastic wrap and refrigerate. The water will prevent the yolks from drying out. When ready to use, the water should be easy to pour off or just incorporate them into the eggs. Allow your Whites to come to room temperature before beating them. Cold Egg Whites will not beat up as well as the warmer ones and therefore will not be able to incorporate enough air to make a light cake. 2. 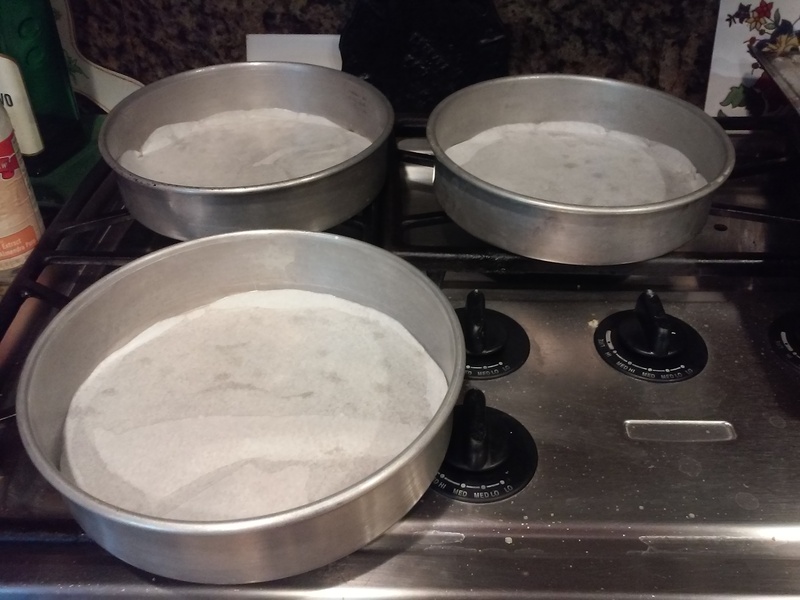 Use a tube pan that is large enough to hold at least a 12 Egg White Cake. Never, ever grease the pan when making Angel Food Cake or other Sponge Cakes. 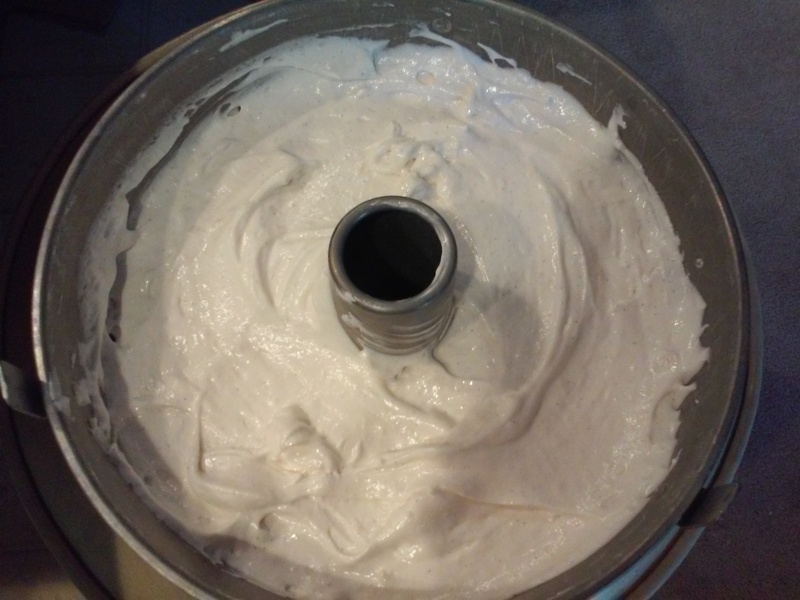 The lubricant will make the batter fall down and not raise up sufficiently. 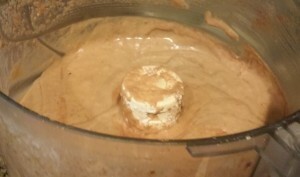 The Angel Food Cake needs the ungreased walls of the pan to cling to when raising in the oven. 3. Always use Cake Flour for an Angel Food Cake. 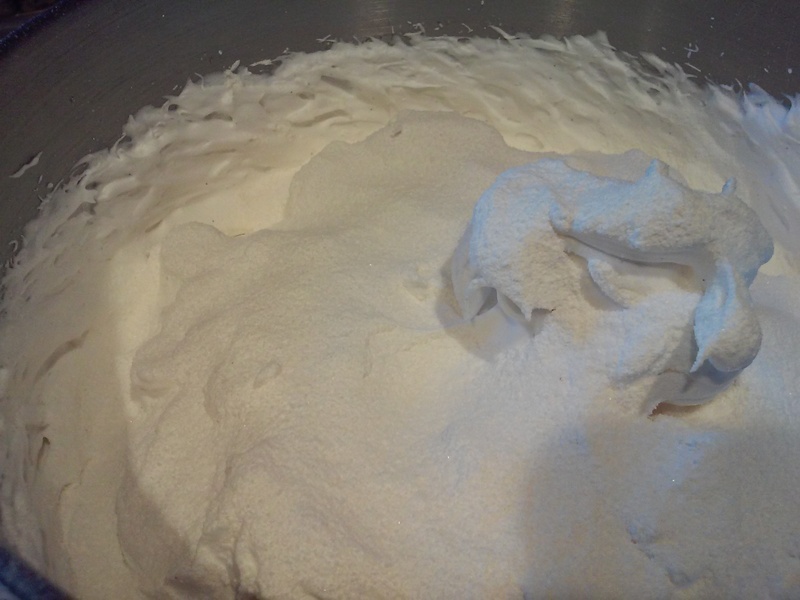 (Cake Flour is lighter than All-Purpose and will therefore give you a lighter cake. Spoon the Flour into a dry measuring cups and level off with a straight-edged spatula. 4. Sift the Flour and half the Sugar into a clean, dry mixing bowl. 5. Make sure the bowl that you are going to beat the whites into is clean and dry; any speck of grease or other residue will prevent the Whites from beating up properly. 6. 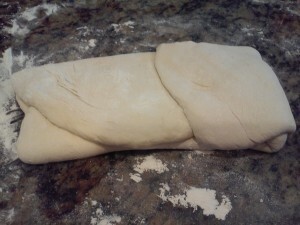 Always, fold the flour into the beaten whites, DO NOT MIX – the folding process is an over and under motion. 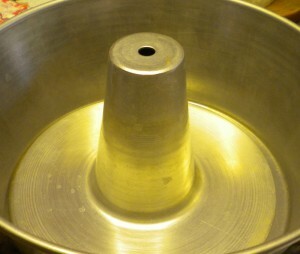 Beating will deflate the Whites and prevent the cake from raising up properly. 7. When you are ready to begin your cake preparation, lower your oven rack to the lowest setting and heat the oven to 350 degrees. 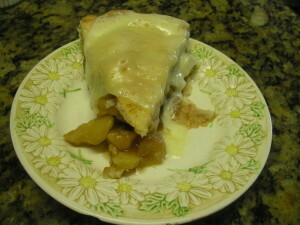 For the recipe go to angel-food-cake/. This recipe is a 12 Egg White recipe – for a taller cake increase the recipe by 1/2 – use 1 1/2 cups of Whites instead of 1 cup. Increase all the other ingredients accordingly. For the increase recipe use a 12 inch tube pan. 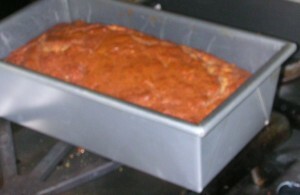 The cake pictured in the recipe was made in a 10 inch tube pan. I prefer the large one because it make a more attractive cake. The best and easiest way to beat your Whites if to use a ‘standing electric mixer’. 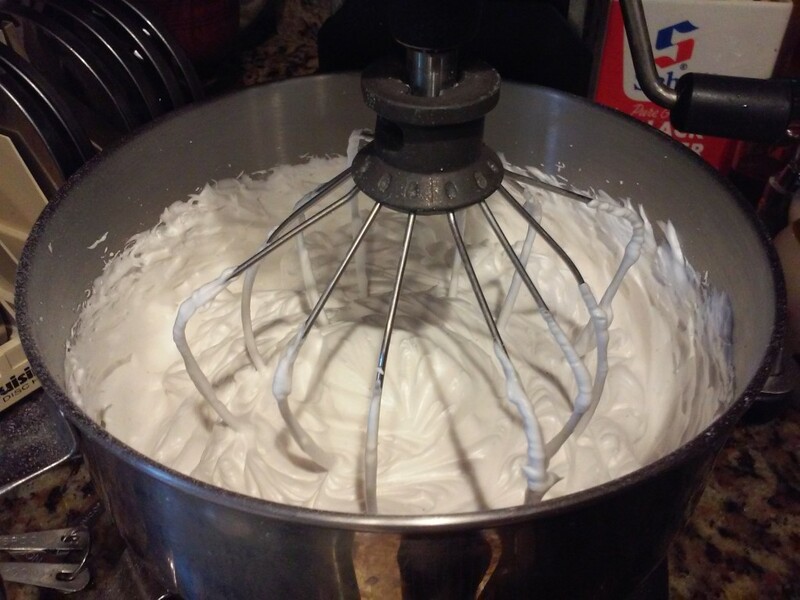 A hand mixer can also be used but the standing mixer will give you the best results. As an anecdote, the very first Angel Food Cake that I made was when I was a teenager and decided to make for my Mother for Mother’s Day. We did not own an electric mixer or even a hand electric mixer. All we had was a Rotary Egg Beater and this was before they put ball bearings into the wheel. It took me so long to beat those Egg Whites that I ended up with a blister on my thumb. If we had even a wire whisk, that would have been infinitely better. 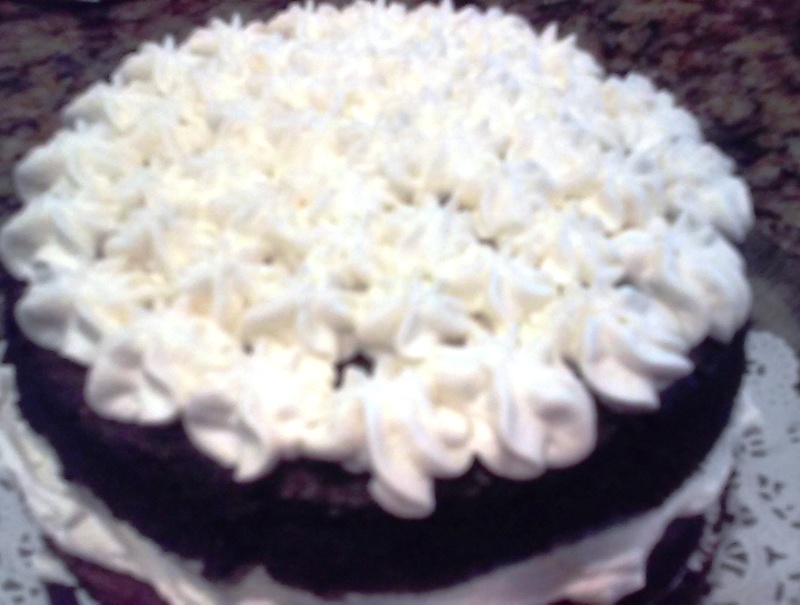 But the Cake turned out fine but I don’t think I made another Angel Food until I owned an electric mixer. Sift the Flour/Sugar mixture over the Beaten Egg Whites and use a rubber spatula to fold the dry ingredients into the Whites. Be sure and get all the dry ingredients incorporated. Use a rubber spatula to scrape the batter from the mixing bowl to the baking pan. Level off the top and then place in the lower third of the pre-heated oven and bake for 45 minutes. The increased recipe bakes for the same time as the original one as the pan you use is larger. a little Heavy Cream, Powdered Sugar and Vanilla. Keep it thin so it can be poured over the cake. delicious dessert or even breakfast. 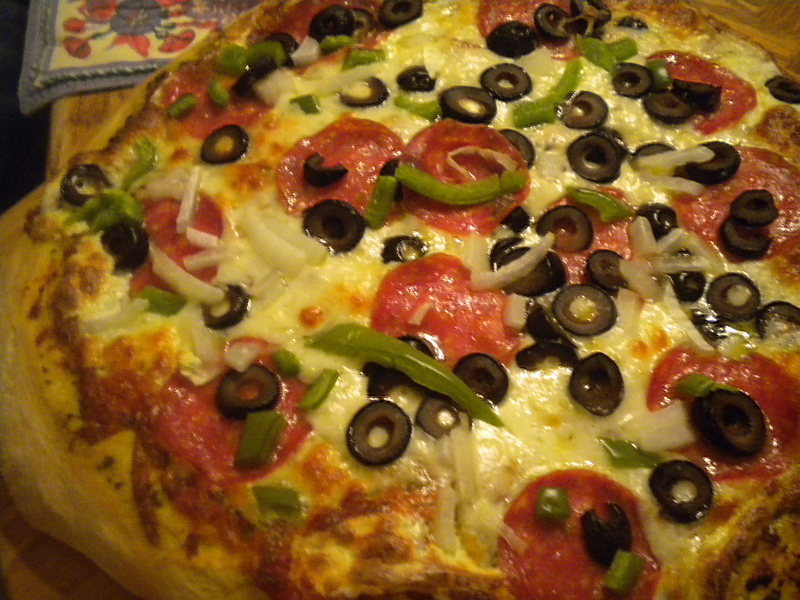 Monday, February 9th is ‘Pizza Pie Day’. Are you going to go out and have pizza? Or are you going to make and bake your own? Homemade Pizza is delicious and easy to make. 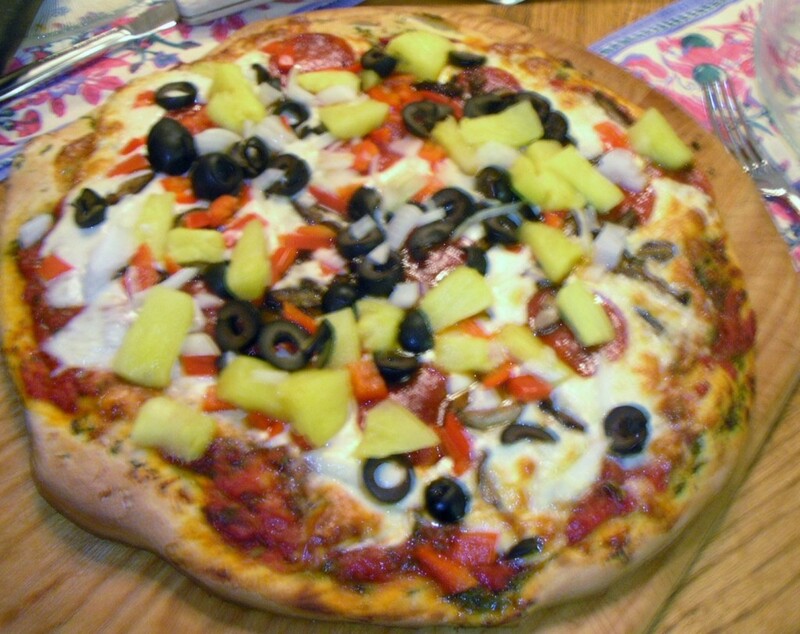 I will say that it probably won’t cost you any less to make it than to buy it but the ingredients you use will be better than the ‘Take-Out Pizza’ or the Pizzeria Pizza. Pepperoni or whatever else you want on your pizza. If you don’t want to create your own, here are some suggestions from other Posts and Pages from Sylveees Kitchen. 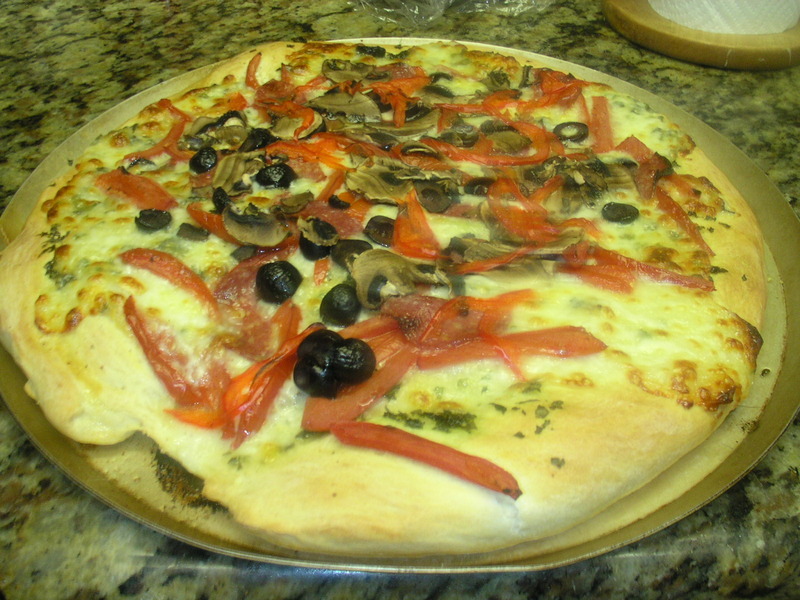 Okay everyone, get busy and make some Pizza tonight or tomorrow. If you don’t get around to it tomorrow which is Pizza Pie Day, you can still do it anytime this week. The second week in February is ‘American Pizza Bake Week’.